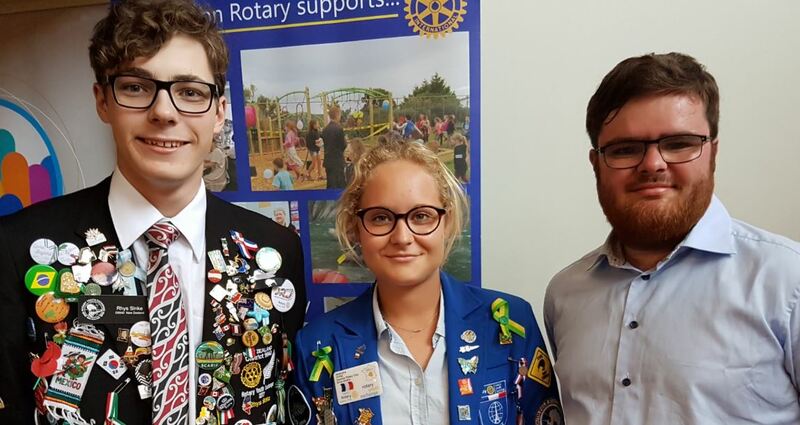 Plimmerton Rotary’s exchange student for 2017-2018 is Amandine Veine from France. She spoke to members at their meeting on 20 February, describing her recent trip to the South Island with nine other Exchange students. Their tour had begun in Abel Tasman National Park with a kayaking adventure. “The golden sands and blue water were so beautiful.” From there they journeyed down the West Coast, stopping to view Franz Joseph and Fox Glaciers as well as Lake Matheson. On reaching Queenstown the group took a ride in the Shotover Jet Boat which was a huge thrill for Amandine. But a much greater thrill was in store in nearby Wanaka, when Amandine decided to take a parachute jump from a small plane. It was a tandem jump attached to an experienced jumper, initially in free fall without an open parachute. Amandine showed a video of their jump taken by another jumper who left the plane at the same time and filmed them as they descended. From Central Otago the group visited Te Anau where they walked part of the Routeburn Track, then on to Mount Cook, and finally to Christchurch where they visited the Antarctic Centre. Amandine commented that whereas the group had met as strangers, they parted as close friends. Currently a student at Aotea College, Amandine enjoys basketball, and is the French language assistant for Year 9 students. Rhys’s goals for his trip had been to see some of Europe, visit Omaha Beach in Normandy, and learn another language. He achieved all three goals. He also developed as a person. “When I left I was pretty shy, something of a closed book. But this trip has given me a huge boost in self-confidence.” Rhys had joined the school basketball team at the school he attended. He found this was a good way of meeting other students. At any one time, some 8000 Rotary Exchange students worldwide are visiting another country for a year, living with host Rotary families. The principal aim of the programme is to promote international peace and understanding. If you would like more information, please contact Ken Gardner, International Director of Plimmerton Rotary at 021 0887 1719. Original generation time 1.3510 seconds.